"UNFORGETTABLE, ENTERTAINING, MESMERIZING". These are just a few words to describe this Malaysian & Australian Duo. 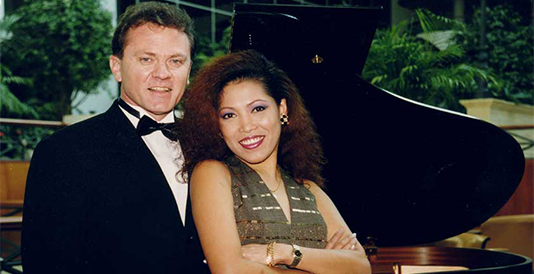 Comprising the very attractive, talented and versatile DANA HARUN: lead vocalist and TONY QUAYLE: pianist; vocalist; keyboardist. Their rich musical background allows them to cover many musical styles from easy listening,Jazz, Standards, Reggae, Rhythm and Blues, contemporary rock and dance, as well as the latest hits of today. This dynamic duo has established an impressive work record and have been extended or asked back to every contract they have taken since they started performing together in 1998. An asset to any first class entertainment venue, Dana & Tony can respond to your entertainment needs and the mood of your audience. Their warm, exciting, and spontaneous performances, combined with their thoroughly professional approach, is guaranteed to thrill your audience and entice them back time after time after time.